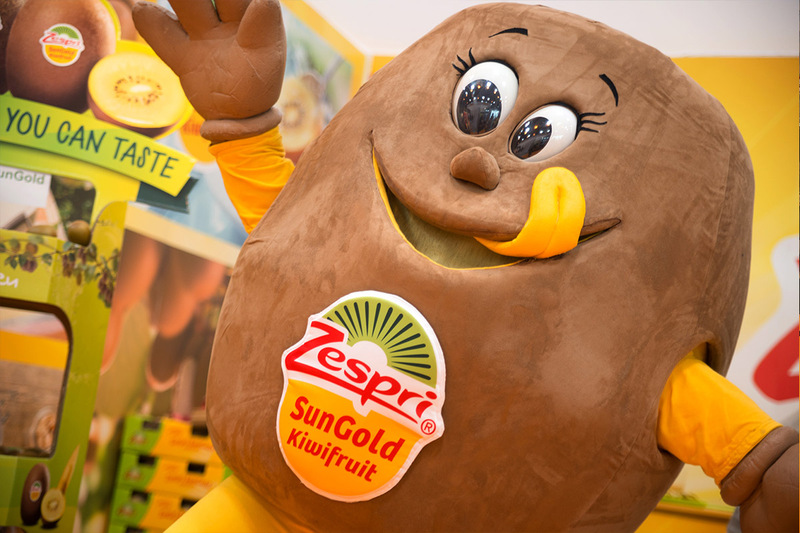 Pink Sky has been working with Zespri this year. 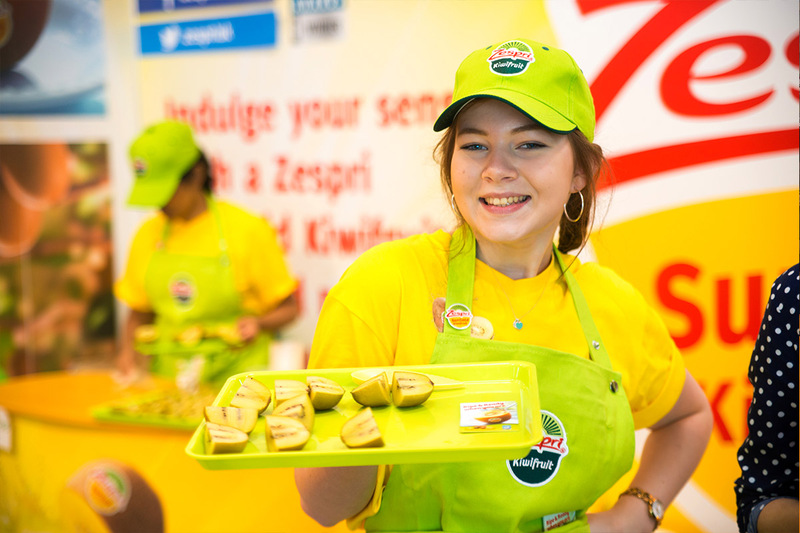 Zespri is one of the world's leading horticultural companies and a category leader in supplying kiwifruit. They provide high-quality, premium kiwifruit all over the world. Our goal has been to further awareness of their kiwifruit and ultimately drive sales. We did this through exhibiting at shows, running pop-up tasting events and distributing recipe cards and promotional items. 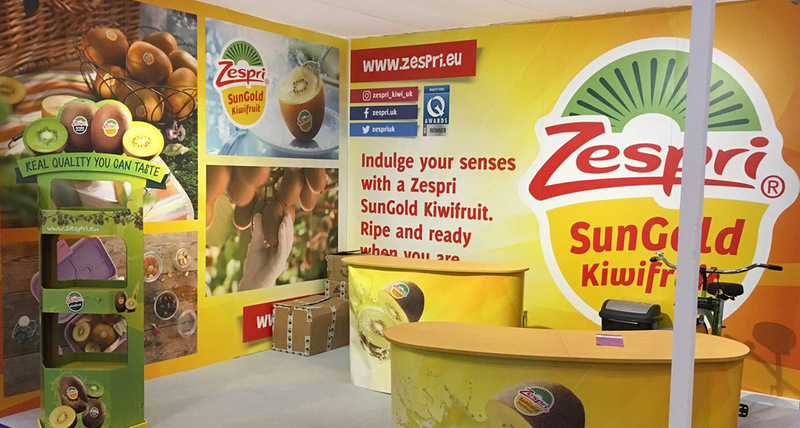 Zespri was keen to have a presence at four shows this year, with a focus on their SunGold variety of kiwifruit. Pink Sky designed stands for each of the four shows. 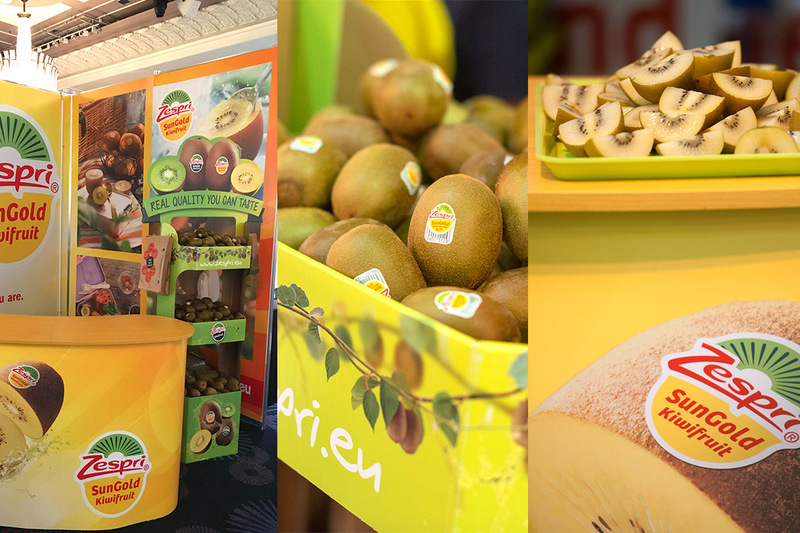 Using Zespri branding, photography and colours, we created a bright and eye catching exhibition stand to attract visitors to the stall. These shows were: This Morning Live, London Produce Show, and two BBC Good Food Shows. The shows had an interactive feel, with activities to draw the public in. The stands featured attractions to encourage people to come and try the fruit. 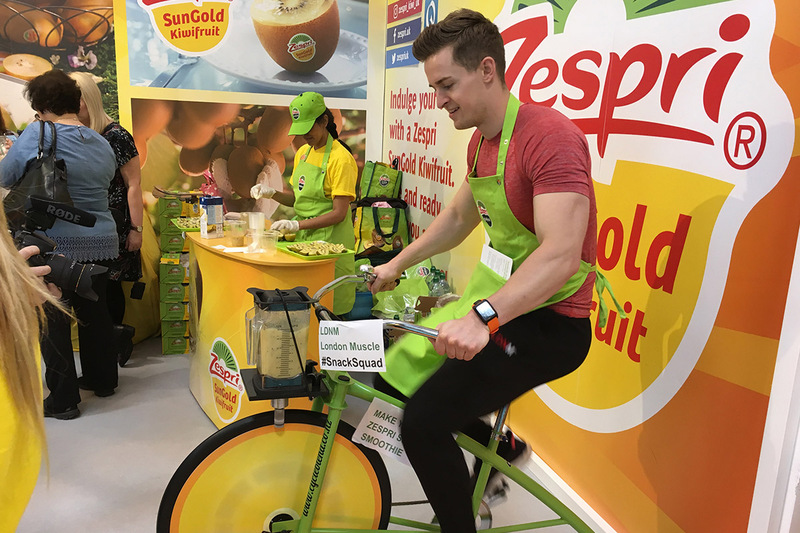 These included: smoothie bikes, attendance of London Muscle, bloggers, competitions using social media, large kiwi mascot suit and money raised for charity. These were popular features that had people laughing and sharing their experiences on social media. Pink Sky provided services such as; booking pitches, design and print of show stands, design and print of promotional literature, staffing for events and training, running competitions, high-end photography, filming of each show set-up and take-down for event, fruit sampling and a brief report following each activity, with a full report at the end of campaign. Selling kiwifruit at each show was a great way for people to get their hands on the fruit to take home and to also raise some money for charity. Zespri kindly supported Pink Sky’s chosen charities for these events. One of the kiwifruit varieties we were focusing on this year was the Sungold kiwi. 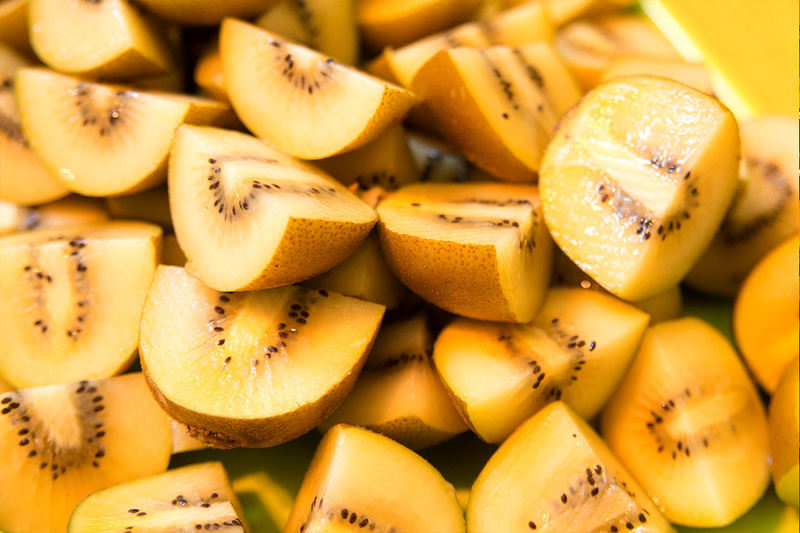 This kiwi is a golden-fleshed variety with a refreshing sweet taste with just a hint of sour. It is an attractive, larger kiwifruit with a smooth skin and can be eaten whole. Zespri SunGold is a great source of vitamin C, and one of the most nutrient-dense fruits available. We also launched a competition to win a signed copy of London Muscle’s book and Zespri merchandise; including water bottles, power banks, memory sticks and umbrellas. 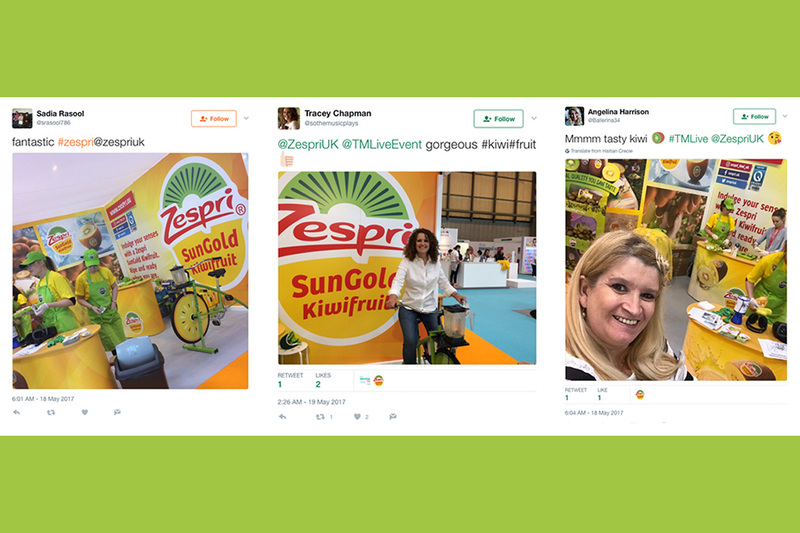 The staff on the stand raised awareness of the competition and encouraged people to tweet Zespri to win. There was a great reaction on social media which was encouraging. 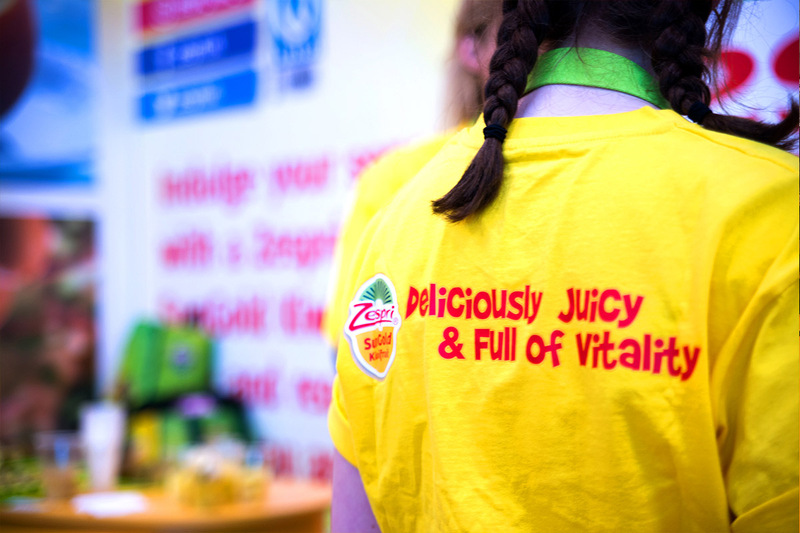 We love working with Zespri and being a part of raising awareness for the amazing kiwifruit.